Members of the winning team Arsalan Esmaelli, Cindy Liu, and Nicholas Chu pictured with the Urban Policy Lab’s graduate fellows Rebecca Hellam, Samuel Jerez, Matthew Plouffe, and Breanne Bateman, and judges Carolyn Kim and Kelly Strueby. The Urban Policy Lab Case Competition is an annual student-led initiative, organized by the Lab’s Graduate Fellows, that focuses on tackling municipal and urban policy problems. 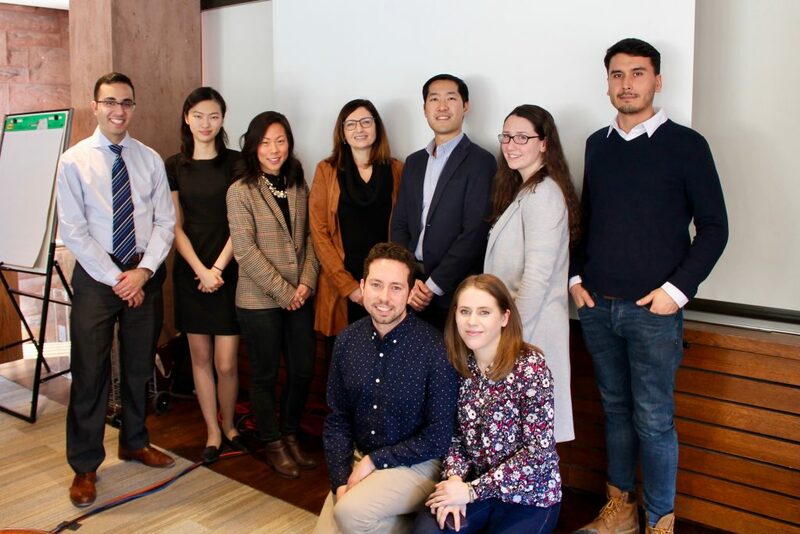 This year marks the fifth edition of the event formerly known as the Municipal Policy Action Case Competition, which offers students at the Munk School of Global Affairs & Public Policy the chance to hone their creative and analytical abilities in a fast-paced, real-world simulation exercise. Past topics have ranged from mental health within Toronto Community Housing, to digital government, to affordable housing. 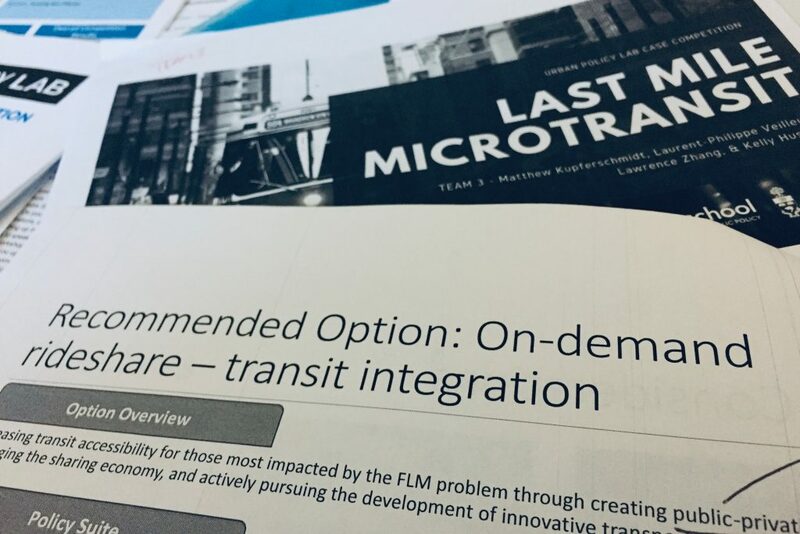 This year’s competition challenged thirty Master of Public Policy students to brief a panel of expert judges on innovative policy solutions to solve the first and last mile transit problem in Toronto. Despite growth in public transit ridership throughout the early 2000s, recently many North American cities have experienced stagnant or decreased ridership. Toronto is no exception, as the TTC has reported that ridership has remained static since 2014. The “first and last mile” problem describes the barriers riders face getting to and from initial transit stops to the wider transit system. For example, many riders in Toronto are faced with long walks to transit stops, inadequate or absent infrastructure for walking and cycling, and unreliable and infrequent transit service that make accessing commuter trains, subways, and bus routes inconvenient and even inaccessible. These issues discourage potential riders from using transit, and therefore impact ridership. Teams were tasked with briefing a hypothetical independent expert panel convened by the City of Toronto, to deliver policy options that address the following question: Given the City’s commitment to encouraging public transit use, how can Toronto improve ridership by reducing barriers encountered by commuters getting to and from transit stops? Gabriel Eidelman, Director of the Urban Policy Lab. Participants rose to the challenge and presented a number of exciting and innovative policy solutions to the first and last mile problem. Below are four great ideas presented by teams on competition day. Several teams recommended investing in transit technology, pointing to proven Mobility-as-a-Service (MaaS) solutions utilized in Helsinki, Finland. MaaS aims to encourage transit use by connecting riders to a variety of transit options in one single and easy to use app. Commuters are able to plan, book, and pay for trips utilizing various transit options, such as bike sharing, car sharing, taxi, and public transit, all in one app. Many groups proposed allowing for different monthly subscription packages based on transit use in addition to the option to pay for single trips. Teams argued that MaaS would help solve the first and last mile problem and boost ridership by making transit more convenient and by improving access to larger transit networks. The judges praised the teams’ innovative recommendations and commended them for their willingness to explore solutions outside of North America. Other teams proposed demand responsive transit options, where bus service is based on demand rather than a fixed schedule. This option would allow riders to be picked up and dropped off at their desired location rather than having to go to a pre-designated stop. Teams argued that this recommendation would solve the first and last mile problem in neighbourhoods underserved by the existing transit system or facing low passenger demand by improving efficiency and convenience. One team pointed to a successful pilot program in Belleville, Ontario, where underused fixed late-night bus routes were transformed to an automated on-demand service able to optimize routes by processing data in real time. 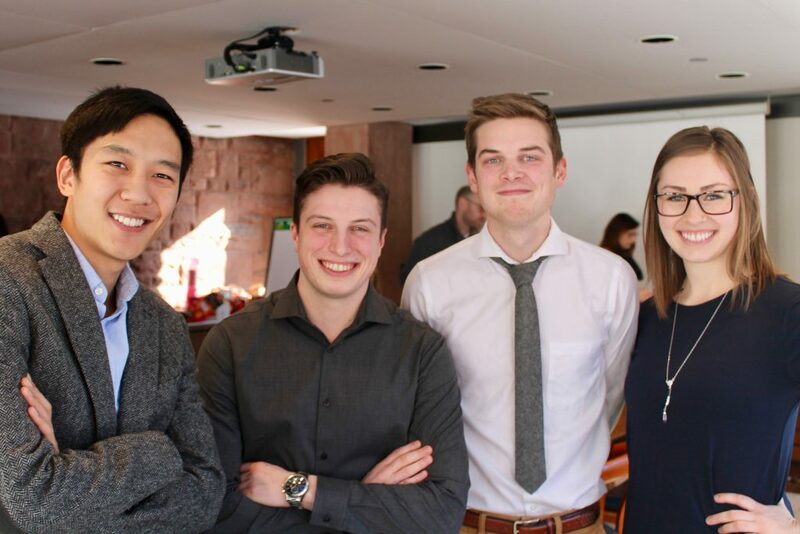 The runners-up, a team comprised of first-year students Matthew Kupferschmidt, Laurent-Philipe Veilleux, Lawrence Zhang, and Kelly Husack, proposed utilizing mini-busses and flexible routes in low-density neighbourhoods to save costs and improve the rider experience. The team argued that a unsuccessful 1972 GO Transit pilot should be revisited as a potential solution for the first and last mile problem in areas of Toronto outside of the downtown core. Their proposal included outlining how the costs of the solution could be partially recovered by a lot-frontage based levy imposed in areas of service. The team was commended for their creative approach to the problem and outstanding presentation skills. Members of the runner up team (left to right) Lawrence Zhang, Laurent-Philipe Veilleux, Matthew Kupferschmidt, and Kelly Husack. The winning team, comprised of second-year student Cindy Liu and first-year students Nicholas Chu and Arsalan Esmaeili, recommended implementing a one-year, subsidized on-demand ridesharing pilot for commuters in eligible neighbourhoods. The pilot would allow eligible riders to be picked up at their home or virtual pick up stop and taken to the nearest transit station, where they could then utilize the existing public transportation system for the remainder of their journey. Eligibility was assessed on two criteria: the rider had to live more than a 500m walk from a bus or subway stop and had to live in a designated Neighbourhood Improvement Area. The group argued that the pilot would help solve the first and last transit problem and improve equity and opportunities for residents in Toronto’s most disadvantaged communities. The winning team was praised for their creativity, targeted solution, and extensive analysis of equity considerations in their proposal. 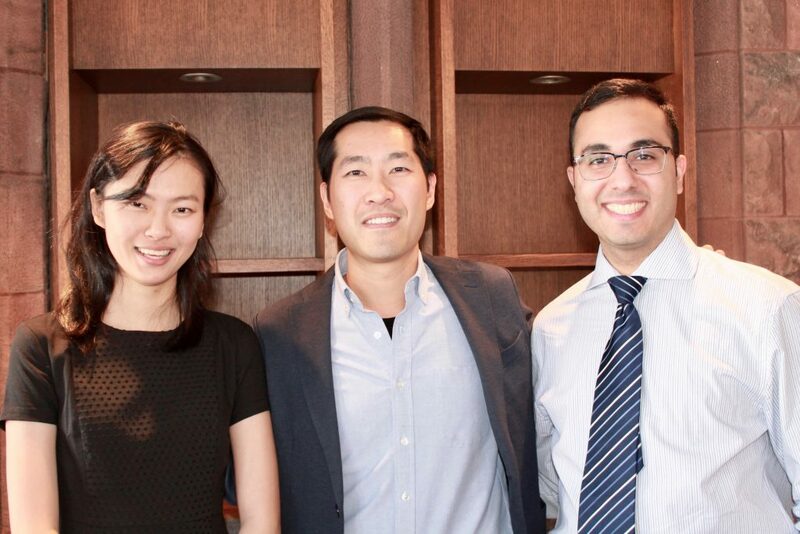 Members of the winning team (left to right) Cindy Liu, Nicholas Chu, and Arsalan Esmaelli. Congratulations to the winning team and thank you to all who participated. The Urban Policy Lab looks forward to hosting another successful case competition in 2020! Breanne Bateman holds a B.A. (Hons.) in History and English from Wilfrid Laurier University. Now in her second year of the Munk School’s Master of Public Policy program, she recently completed an internship at the City of Mississauga, in the Transportation and Infrastructure Planning Division. Breanne’s policy interests include environmental policy and sustainability, particularly water and food policy.